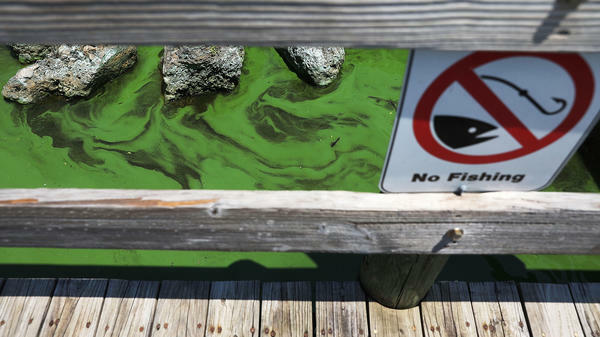 Green algae is seen in the St. Lucie River in Stuart, Fla. Local GOP Rep. Brian Mast is making legislation to deal with the algae problem a focus of his re-election campaign, as his Democratic opponent Lauren Baer criticizes him for doing "too little, too late." On Florida's St. Lucie River, east of Lake Okeechobee, locks and a dam hold water before it races downstream to the estuary on what is known as Florida's Treasure Coast. But looking out over the river, Stephen Davis with the Everglades Foundation sees signs of trouble. "There's a pretty substantial mat of the blue-green algae we see floating on the surface," the wetland ecologist says. "As soon as these gates are open, the water will pass out into the estuary." Peter Girard with the environmental group Bullsugar.org says, "You can smell it before you see it. And of course, heading into the holiday weekend, you had beach closings around the inlet up and down the Treasure Coast." For months now, mats of algae from Lake Okeechobee have been flowing down the river, bringing toxins that can affect people and animals. In beach communities east of the lake, the algae have had a big impact on tourism and businesses. With more toxic algae blooms on Florida's west coast and a red tide algae bloom causing massive fish kills in the Gulf of Mexico, water quality is increasingly having a big impact on key midterm races in Florida. While Democrats tend to be more outspoken on environmental issues, Republican candidates are also speaking up because they're feeling the heat. For Brian Mast — a Republican congressman whose district is east of Lake Okeechobee — the algae bloom, water quality and the environment have become a signature issue. At a recent news conference on the waterfront in Stuart, Mast said, "I've got a dock in out my backyard. My kids like to jump in the water. I can tell you that 2018, my family hasn't been out on this water for recreation, not once." Two years ago, this district went solidly for Donald Trump, electing Mast and flipping the seat from Democratic to Republican. Since then, Mast has been a reliable member of the Republican caucus, voting to repeal Obamacare. But he's staked out independent positions on some issues, especially those involving Lake Okeechobee and water quality. This week, backed by environmental groups, Mast announced legislation he has introduced in Congress. It would force the Army Corps of Engineers to minimize the potential for algae blooms by making the health and safety of coastal residents a priority when releasing water from Lake Okeechobee. Mast says he expects the bill will face significant opposition from the Corps, state water managers and farmers south of the lake. "We know that that's a challenge," he said, "but it's a fight that we have to go out there and have on behalf of our community." Mast's opponent, Democrat Lauren Baer, is calling his bill "too little, too late." She says toxic algae in Lake Okeechobee has been a problem since the first-term congressman took office and it's taken him 19 months to come up with legislation. 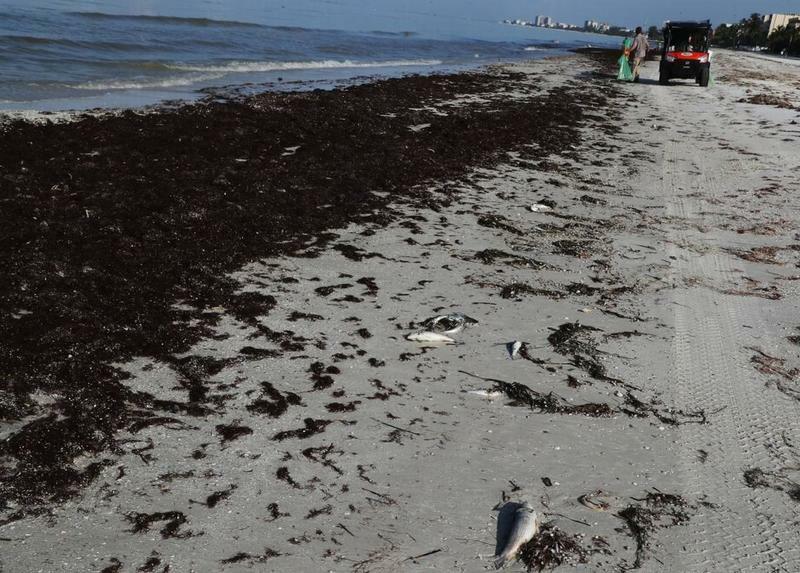 On Florida's west coast, where there's a red tide algae bloom, Republican Congressman Vern Buchanan is in a similar situation, touting his record on the environment as he's challenged by Democrat David Shapiro. A dark money group that supports Democrats, Majority Forward, recently began running an ad targeting Florida Republican Gov. Rick Scott, who's running for the Senate against incumbent Democrat Bill Nelson. The ad shows disturbing pictures of dead manatees and beaches littered with dead fish. The narrator says, "It's fair to blame to Rick Scott. He savaged environmental safeguards and slashed $700 million from water protection." Scott has long been criticized for slashing money for land conservation and environmental regulation. But he's running a campaign ad targeting Nelson for some of the very things Scott is charged with. "Washington politician Bill Nelson made a pledge 30 years ago to solve this problem," the ad says. "But Nelson is a talker, not a doer. With Bill Nelson, we get more waiting, more talk and more algae." In Florida — a state with an economy built on tourism — clean water, pristine beaches and environmental preservation have always been important. But the environment has typically not been an issue that's determined the outcome of a race. Girard of Bullsugar.org thinks this year may be different, especially in the Senate race. "The disaster you're seeing on the coasts absolutely will be a factor in that race," he says. "Water quality and the governor's impact on it will be something that we expect people will be thinking about when they head to the polls." Both Gov. Scott and Sen. Nelson have made multiple trips to the areas suffering from the algae blooms. This week, Scott announced that the federal government, at his request, is making disaster assistance available for businesses affected by the blooms on both coasts. Water quality and the environment have become a top election issue in some key Florida races after a summer marred by problems with tainted water. Toxic blue-green algae coming out of Lake Okeechobee has hurt fishing and forced beach closures on the state's east coast. 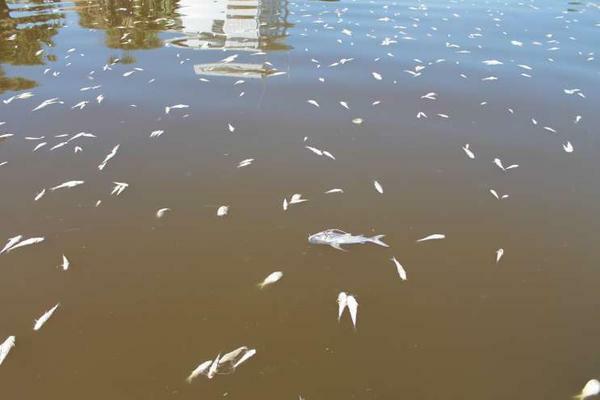 A separate red tide algae bloom is responsible for massive fish kills on Florida's Gulf Coast. NPR's Greg Allen has more on how it's playing out politically. GREG ALLEN, BYLINE: For months now, mats of blue-green algae from Lake Okeechobee have been flowing down the St. Lucie River, bringing toxins that can affect people and animals. Peter Girard with the environmental group Bullsugar says in beach communities east of the lake, the algae have had a big impact on tourism and businesses. PETER GIRARD: You can smell it before you see it. And of course heading into the holiday weekend, you had beach closings around the inlet up and down the Treasure Coast. ALLEN: For the congressman in this area, Republican Brian Mast, the algae bloom, water quality and the environment have become a signature issue. BRIAN MAST: I got a dock in my backyard. My kids like to jump in the water. I can tell you this. 2018 - my family hasn't been out on this water once for recreation, not once. ALLEN: Two years ago, this district went solidly for Donald Trump, electing Mast and flipping the seat from Democratic to Republican. Since then, Mast has been a reliable member of the Republican Caucus, voting to repeal Obamacare. But he staked out independent positions on some issues, especially those involving Lake Okeechobee and water quality. Backed by environmental groups, he held a news conference last week to announce legislation he's introduced in Congress. 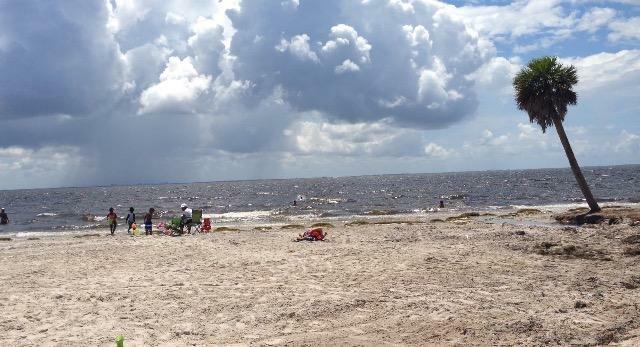 It would force the Army Corps of Engineers to minimize the potential for algae blooms by making the health and safety of coastal residents a priority when releasing water from Lake Okeechobee. Mast says he expects the bill will face significant opposition from the Corps, state water managers and farmers south of the lake. MAST: We know that that's a challenge. But that's a fight that we have to go out there and have on behalf of our community. ALLEN: Mast's opponent, Democrat Lauren Baer, is calling his bill too little too late. She says toxic algae in Lake Okeechobee has been a problem since the first-term congressman took office, and it's taken him 19 months to come up with legislation. On Florida's west coast where there's a red tide algae bloom, Republican Congressman Vern Buchanan is in a similar situation, touting his record on the environment as he's challenged by Democrat David Shapiro. Democrats tend to be more outspoken on environmental issues, but other Republican candidates are also speaking up because they're feeling the heat. UNIDENTIFIED NARRATOR #1: It's fair to blame Rick Scott. He savaged environmental safeguards and slashed $700 million from water protection. ALLEN: That ad by Majority Forward, a dark money group supporting Democrats, shows disturbing pictures of dead manatees and beaches littered with dead fish. Florida Republican Governor Rick Scott is running for the Senate, challenging incumbent Democrat Bill Nelson. Scott has long been criticized for slashing money for land conservation and environmental regulation. But he's running an ad targeting Nelson for some of the very things Scott is charged with. UNIDENTIFIED NARRATOR #2: Washington politician Bill Nelson made a pledge 30 years ago to solve this problem. But Nelson's a talker, not a doer. ALLEN: In Florida, a state with an economy built on tourism, clean water, pristine beaches and environmental preservation have always been important. But the environment has typically not been an issue that's determined the outcome of a race. Peter Girard with Bullsugar thinks, especially in the Senate race, this year may be different. GIRARD: The disaster you're seeing on the coasts absolutely will be a factor in that race. 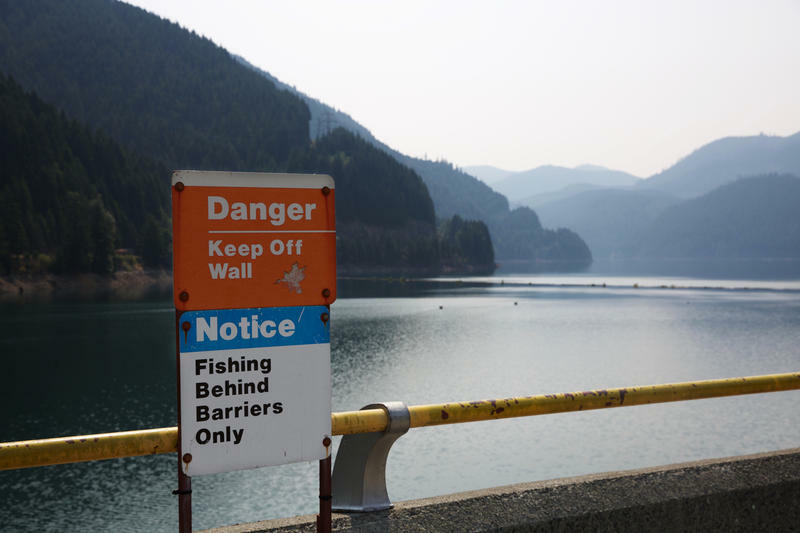 Water quality and the governor's impact on it is going to be something that we expect people to be thinking about when they head to the polls. ALLEN: Both Governor Scott and Senator Nelson have made multiple trips to the areas suffering from the algae blooms. Scott announced recently that at his request, the federal government is making disaster assistance available for businesses affected by the blooms on both coasts. Greg Allen, NPR News, Miami. (SOUNDBITE OF DANISH STRING QUARTET'S "SHINE YOU NO MORE") Transcript provided by NPR, Copyright NPR. The vague warning jolted citizens in and around Salem, Oregon to attention on May 29. "Civil Emergency in this area until 1128PM," read the text message alert. "Prepare for action." It was a ham-handed message — one that left some wondering if an attack was imminent. In fact, the danger officials wanted to warn them about wasn't coming from the sky. It was coming from their taps. As Florida struggles with 'red tide' algae blooms on the west coast and blue-green algae in inland waterways, a federal program to help communities deal with harmful algae outbreaks is set to lose its Congressional authorization at the end of September. Everglades advocates are telling Congress to get moving on a major restoration project needed to help prevent future algae blooms like the ones currently choking inland and coastal waterways in Florida. Tourists weren't scattered on beaches in southwest Florida on Thursday, but hundreds of dead fish were. The Herald-Tribune reports that visitors piled into the parking lot of Venice Beach, got out of their cars, started hacking, coughing and sneezing and then quickly left.